The 3rd chakra healing meditation focuses on your personal power as it relates to the external world. Traveling up the spine, we stop at the energy and emotional center of the "gut," the solar plexus. 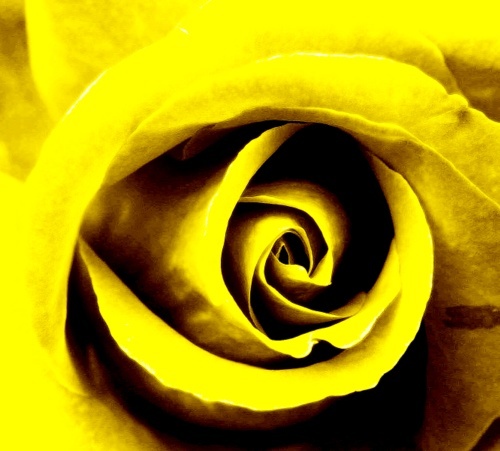 Here, I use the yellow rose to depict the third chakra. The energy "wheel" of the subtle body is reflected in the swirl of the rose, as it unfolds. Gaze upon the spiral and open your heart for clearing and balancing your third chakra. (You may desire to first read the article Chakra Yoga, if you are unfamiliar with the subtle energy body). The first three chakras, or emotional centers are Earth-based, dealing with all that provides solidarity and security in our lives. They are primarily about finding physical power in the world. To review, the first is about finding your identity and power within the group or tribe. The second is how you find yourself and your power in relationship to others. As you explore the third chakra, the primary issue at hand is finding your personal power in relation to the external world. The energy vortex spins in a different pattern and you become an individual. Here you develop the "Self" and the ego that no longer requires the input from others to tell you who you are. The primary task in this emotional and energy center, as an individual, is in developing your self-esteem, and your relationship with yourself. Understanding yourself is paramount in order to have a healthy 3rd chakra. From this energy and emotional center comes self-esteem, self-respect, self-discipline and the ability to create action to achieve those things that are most important to you. The Earth-element of the 3rd chakra is fire, the major life force is combustion. Personal power is fiery and full of action and combustion. It is the determinant of your strength of character. This energy is full of purpose and can be transformational. It is through the action of will and personal behaviors which conquers inertia and moves one forward to accomplish all that is essential for self-fulfillment. It is healthy self-esteem that allows for personal choices that serve your highest self. The third chakra's basic right is in your right to act independently. Closely related is your right to make your own choices and create yourself as you see fit. This action you take may even be in direct conflict with your family, your group or your tribe. Conflicts of interest are the fuel that fires personal will and action. If your third chakra is weak, lacking courage to take actions for yourself, you may never fulfill your dreams. Even with a healthy and open 3rd chakra, there is a difference between the desire to take action, and actually taking that action! Indecision, procrastination, self-doubt and stagnation are all barriers to acting on your deepest desires. The 3rd chakra energy is fueled by the courage to take risks, to move forward in what you must do to become your highest self. This is the dilemma you face ~ knowing in your heart that change is needed, yet failing, for one reason or another, to act to create the necessary change. My third chakra healing meditation will help you mobilize that energy, and help fuel your courage to take action and make the necessary changes. Change is two fold - changing your beliefs and the way you think about yourself AND having the faith and courage to take action. It is emotional, mental AND physical action. This all adds up to "Fire for the Soul!" Moving through the color spectrum, the color of the third chakra and its power is yellow. The location of the energy center is above the navel, to just under the breast bone where the ribs meet, called the solar plexus. Ever wonder how this area of the body came to be called the "solar" plexus? It is because of the color yellow, and the power of the sun and its fire, according to the ancient traditions. This center is sometimes known as the navel chakra, but I prefer to call it the solar plexus chakra, as the area includes much more than the navel. I have also referred to this energy center as the "core of my being," because indeed, it is the physical, personal center of gravity. When you strengthen the core of the body, you strengthen the 3rd chakra. The energy of the sun and its fire fuel your personal power. The third chakra is your own, internal combustion center that fuels your self-esteem and your self-respect. This is a wonderful metaphor to remember the meaning of this chakra. The chakra healing meditation for this area visualizes the power of the sun and its fire to fuel your personal power. The Sanskrit name for the 3rd chakra is Manipura which means, "city of jewels" or "lustrous gem." This center shines bright like the sun, full of illuminated and radiant energy. Your personal center of dignity and honor are gems indeed. The unique mantra for the 3rd chakra is "I can." Maybe you recall the children's story called, "The Little Engine That Could." If you have children and haven't read this yet to them, I would highly recommend it. This story is a perfect example of teaching the lesson of developing personal power. The story is about a little engine who doesn't know if he can make it up a big mountain when he is called to pull a heavy load. He keeps saying, as he chugs along, "I think I can, I think I can, I think I can!" And lo and behold he does, steadily and slowly make it up and over the mountain, despite many dangers. His little response, after his success was, "I thought I could, I thought I could, I thought I could!" There is no better metaphor in a story, to illustrate the 3rd chakra energy, than The Little Engine that Could. They even show his little combustion, coal stove that represents his internal fire! I actually found a YouTube link to watch and/or show your children: The Little Engine that Could. As you watch, feel your own internal combustion engine revving up your personal strength and power! If you have no self-esteem and you dislike yourself, you will be unable to make healthy decisions. Instead you will rely on others to make them for you, relying on their approval before you dare make any moves. You do this to impress and please someone else, or ensure they don't disapprove of you, so that you keep your safe and secure environment(s). We all know the person who is unable to leave an unhealthy relationship, because of the fear of having to go it alone. The loss of financial support, "love" and security are too much to bear. Or it may be an unhealthy job that does not utilize or honor your skills. You become stuck in fear and unable to believe that something out there is waiting to fulfill you. Deep within all of us is the fear of rejection, humiliation, criticism and personal failure. Fear of aging, obesity, balding or other physical problems are also issues in this energy center. We harbor many secrets that we fear others will discover about us, that if they knew would weaken us. While it is normal to feel any of these feelings once in awhile, if they predominate your thoughts, or you are overly sensitive to them, it can lead to ill health. Then the 3rd chakra energy becomes blocked and manifested in unhealthy ways, emotionally and physically. My chakra healing meditation for this emotional center, will help you open this area and allow more vital life force and personal power to enter! As you might expect, the excessive ego and personal power shows up as arrogance, independence to the extreme, bullying others and being strongly opinionated on all matters. Those who are always right, always expressing themselves as authorities on everything have an overabundance of personal fire and combustion. The solar plexus chakra's Sacred Truth is "Honor Oneself." The person who has faith in herself and in her abilities is the person with a well-developed self-esteem and plenty of personal power. The spiritual power of this chakra is creating an identity for herself, apart from the tribe. It is how the individual relates to herself, stands on her own and honors her own thoughts and feelings. She can only do this if she is willing to trust in herself, that she can take care of herself and knows what is best for herself. This well balanced person is generous and grounded in personal ethics, is able to generate action as needed for self-improvement and able to take calculated and necessary risks. In order to honor yourself, you must have faith in your personal abilities and believe in your ability to carry out the necessary steps to achieve your personal dreams. Many people have plenty of personal power and self-esteem, yet because of fear of failure or humiliation, never have the courage to implement the actions necessary to meet their soul-calling. Blocked third chakra energy shows up in the stomach, small intestines, liver, gall bladder, kidney, pancreas, adrenal glands, spleen and the lower thoracic spine of the mid-back. The solar plexus area is where you get "butterflies" in your stomach and "gut feelings." It is always important to honor your intuitive guidance in this area. Getting "punched in the gut" is an important metaphor regarding losing your personal power, so if your stomach is your emotional barometer and your Body Window speaking, trust in it entirely. Physical dis-eases that manifest in this area are gastric or duodenal ulcers, intestinal problems, pancreatitis and diabetes, hypoglycemia, indigestion, anorexia and bulimia, hepatitis and other liver dysfunction, and adrenal gland dysfunctions. If you do the chakra healing meditation below, in an open and mindful fashion, you can heal these imbalances. All of my chakra healing meditations are designed to be introspective and meditative. In order to change your energy for healing, you must listen to your Body Window. Listen to those subtle messages of your body that your intuition wants you to hear. I intentionally use movement and body meditations because most people have difficulty quieting the "monkey mind" when they sit in silent meditation. I believe that the body can lead you in opening and releasing, when the mind often cannot. This mindful, moving third chakra healing meditation gives you something to focus on, to aid you in quieting your mind. Focus on your breath, as you practice the chakra healing meditation. Bring your attention to your core, your solar plexus and imagine your inner "solar" energy growing, as you re-light your personal combustion fire. Set your intention to release and open this area for healing. I designed the movements and poses in this meditation to help you feel the energy in your third chakra move effectively for opening and strengthening it! If you have a physical diagnosis affecting your 3rd chakra please ensure you get your primary care provider's permission to practice a physical meditation that uses yoga movements. This chakra healing meditation focuses on physical healing to energize your vital force energy to bring personal power into your life! During your chakra healing meditation, find the pose and then relax into it. Always bring mindfulness to your effort. It is better to hold a pose, and continue deeply breathing, so you can relax and bring minimal effort to the practice. Once you become familiar with the movement or pose, you will find this easier and easier as your 3rd chakra is strengthened. The goal is to find effortless movement and holding of the pose. This expanded consciousness from the physical body to the subtle body is how you find openness and healing. Using this energy is what creates real and lasting changes in your life! May your subtle body be rekindled with energy and fire when you practice opening your 3rd chakra for healing. I wish for you to discover your own subtle body energy as you do this healing meditation for the 3rd chakra. May you always be mindful of your total being, body, mind and soul! When you purchase this digital download, you will receive a bundle with two components. The first is a PDF file with the instructions for the movements in the video. The video was intentionally produced to be meditative. Therefore, the second component, the actual video, has very little talking or instructions within the video itself.